In celebration of Drum Corps International's 35th anniversary, DCI wants to show you how it all began. 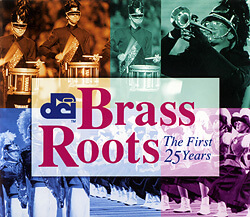 On Tuesday, Nov. 21, leading into the Thanksgiving holiday, DCI.org will broadcast the first part of "Brass Roots: The First 25 Years" at 7 p.m. Central time on the Internet. Put together in 1997 for DCI's 25th anniversary by veteran producer Tom Blair, "Brass Roots" brings DCI founders Don Warren, George Bonfiglio, Gene Monterastelli, Bill Howard and David Kampschroer together in a roundtable gathering to discuss and relive the founding of Drum Corps International and some of drum corps' most historic moments. Experience the history of Drum Corps International with the individuals who started it in this one-hour Internet broadcast offered free to the public. Check it out on Tuesday, Nov. 21 at 7 p.m. Central time right here on www.DCI.org.